Rights-Managed photo of Japan travel photography of the Phoenix Hall, Hoodo also know as Amida Hall, of Byodo-in temple. The Jodo-shiki garden with a pond in a beautiful surreal sunrise autumn scenery framed by Japanese maple tree branches. Byōdō-in (平等院) is a Buddhist temple and was built in 1052. It's also a temple of the Jōdo-shū (浄土宗) and Tendai-shū (天台宗) sects. Phoenix Hall (鳳凰堂 Hōō-dō) is the only remaining original building and is designated as a National Treasure of Japan. 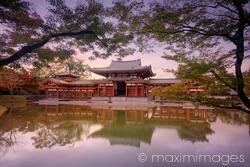 Byodoin Buddhist temple islocated in Uji, Kyoto Prefecture, Japan. This photo was taken in autumn 2017. Byōdō-in 平等院 鳳凰堂 Hōō-dō Jōdo-shiki 平等院庭園 浄土式庭園 世界遺産 宇治市 京都 日本 旅行写真 秋 風景 寺院 池 紅葉 This image is available for licensing for a variety of editorial and commercial uses in publications, designs, web and social media. 6000x4000 px, 68.66MB uncompressed / 9.36MB jpg. Need larger? This Rights-Managed stock photo 'Phoenix Hall Hoodo of Byodoin temple in a beautiful surreal autumn scenery Uji Japan' is created by Alex Maxim and can be licensed for your advertising, corporate, editorial or other use. Click 'Buy Usage Rights' to estimate the license fee and add the image to cart. Licensed files are delivered electronically as soon as the payment is processed.